About a two years ago I picked up a Deepeeka Cluny sword with the intention of reworking the hilt of it and using it as a cheap pel sword. 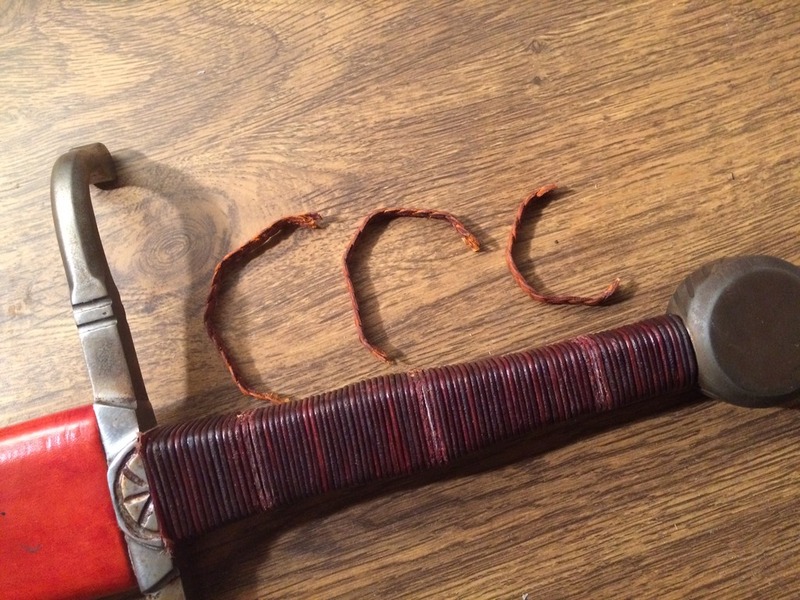 Since then it has just been sitting around, hence the rust on the hilt. I finally got around to doing the project, so first I had to take it apart. 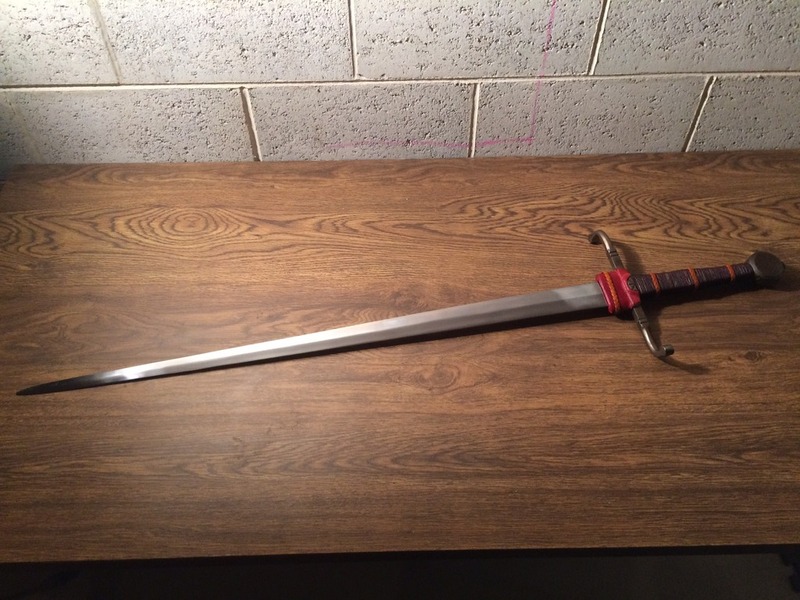 This isn't so much a review, as just a post about what I found upon disassembling the sword. Overall it wasn't too bad, but is still riddled with cheap workarounds and common issues with the lower price range swords. 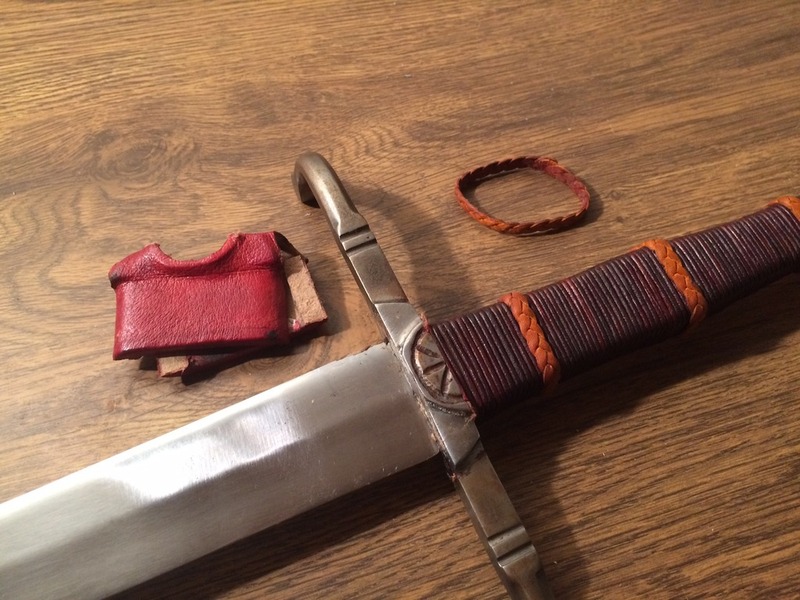 The first thing I took off the was the rain guard, which was made from a piece of thick cardboard glued to the blade, with thin leather covering it. The detail of the rain guard also continues into the cross. 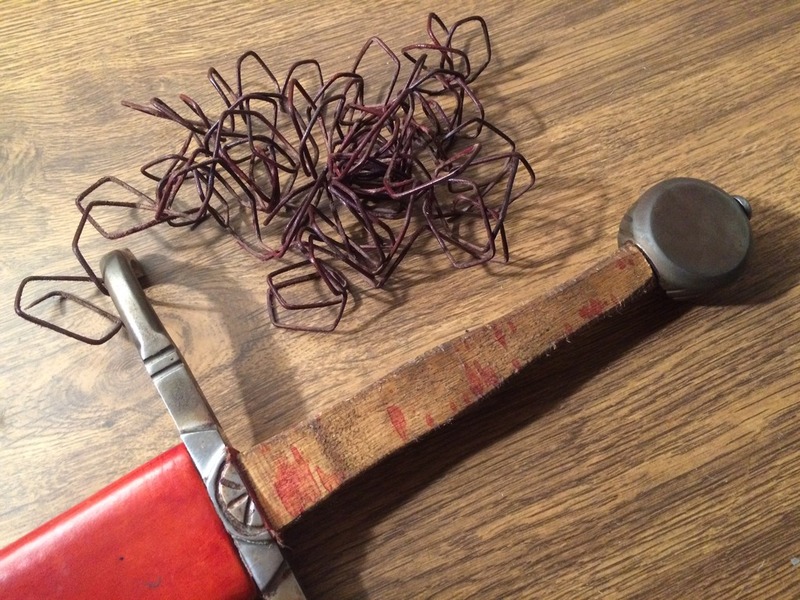 Then I took off the leather cord on the grip. 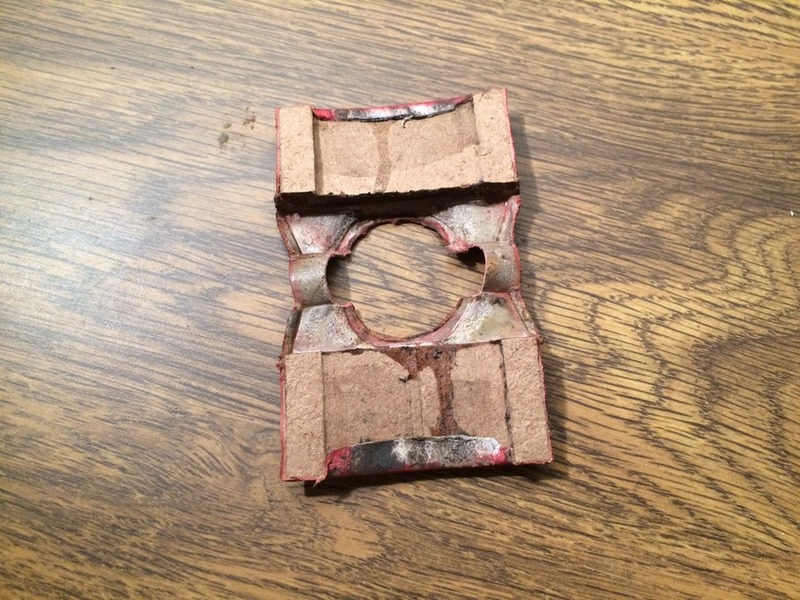 There were three little bands of leather to act as risers, though they wiggled all around only being glued on one point. The cord was only sightly glued down and came off really easily. 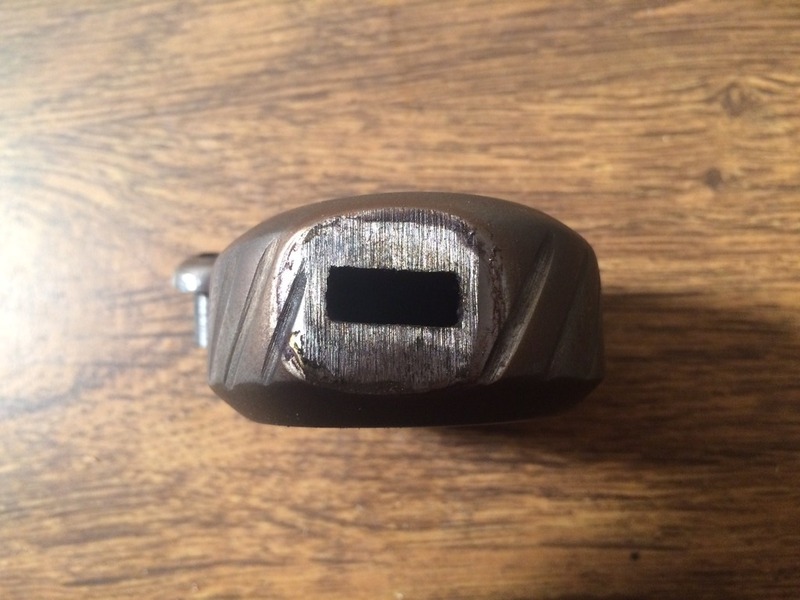 Upon taking off the cord I found that the grip and the pommel didn't meet flush, as shown in this picture. 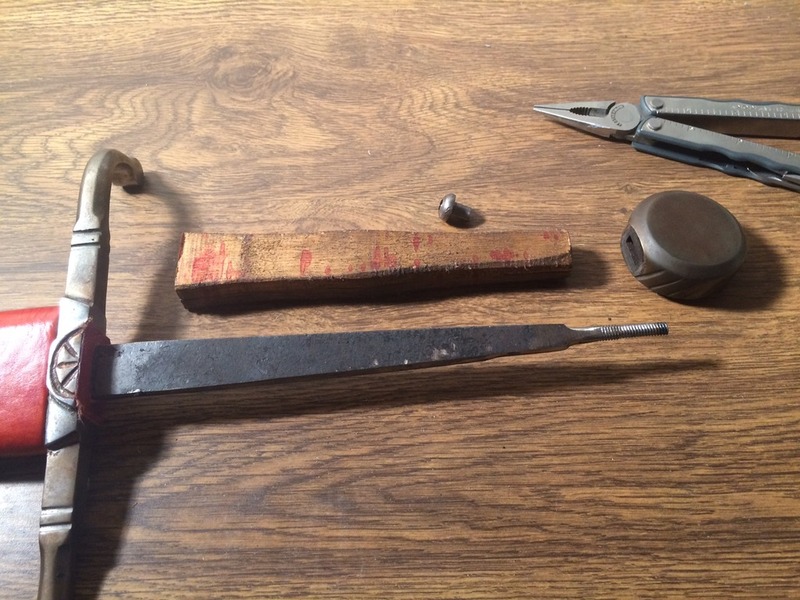 Taking off the pommel was just a matter of unscrewing the pommel but with a pair of pliers. I had originally thought it was peened and ground flat, but I was quite mistaken. 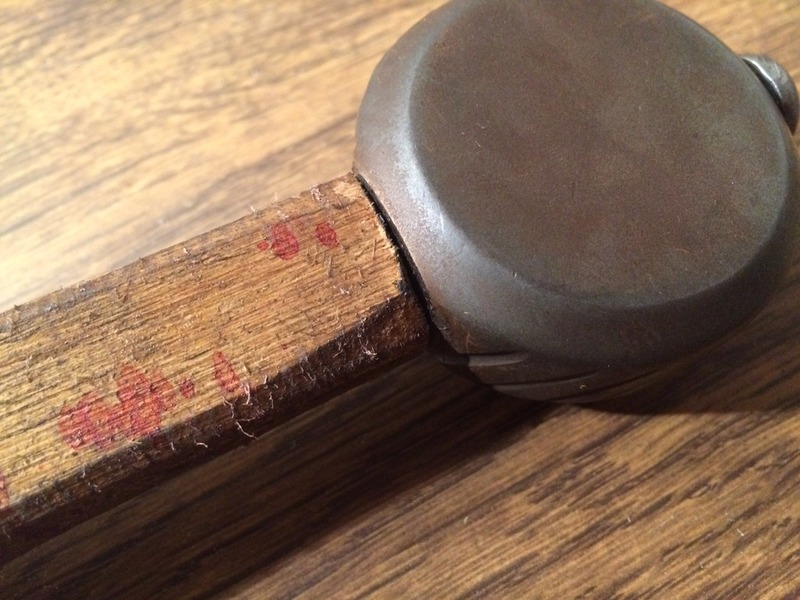 The pommel and grip popped right off once the nut was gone. The tang hole in the pommel is pretty crooked. The other side is just a round hole for the tang nut. The guard at least as a pretty decent recess for the blade to sit into, but more on that later. The tang is pretty beefy, and it impressed me other than the threaded end. There is also an L and a 6 stamped into the tang. The last thing I want to show is the way they made the blade fit into the recess in the guard. This does show slightly when the sword is assembled and I is a real bummer. So that's pretty much what I found under the hood on this sword. I like the size of tang, which is a huge improvement on the old Deepeekas, however they still seem to have the same shoddy finishing that they always have had. Hope some of you found this interesting or helpful. Thanks Sam. I was actually just looking at picking one of these up. 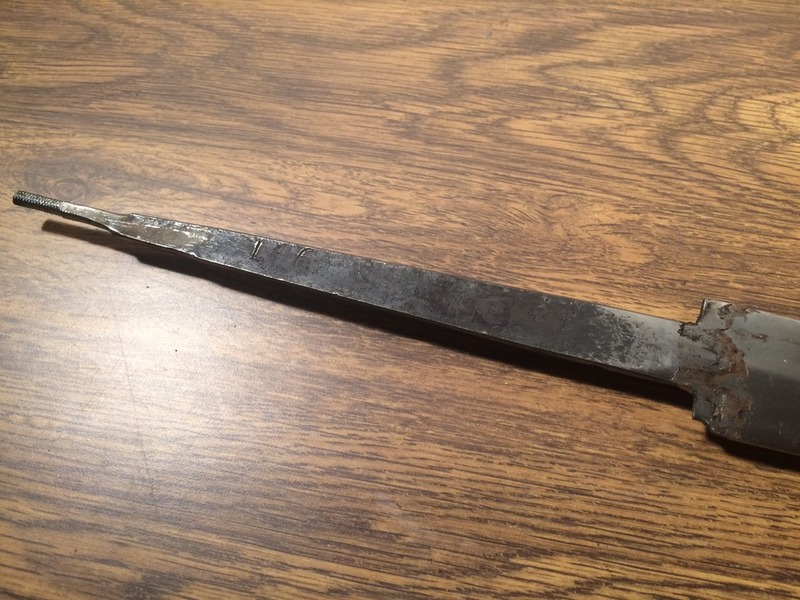 Do we have any idea of the temper of the blade? I was once considering a Deepeeka blade as a project, but last time I looked at their site, none of their steel was hardened or tempered. It did look to be decent quality steel, however. 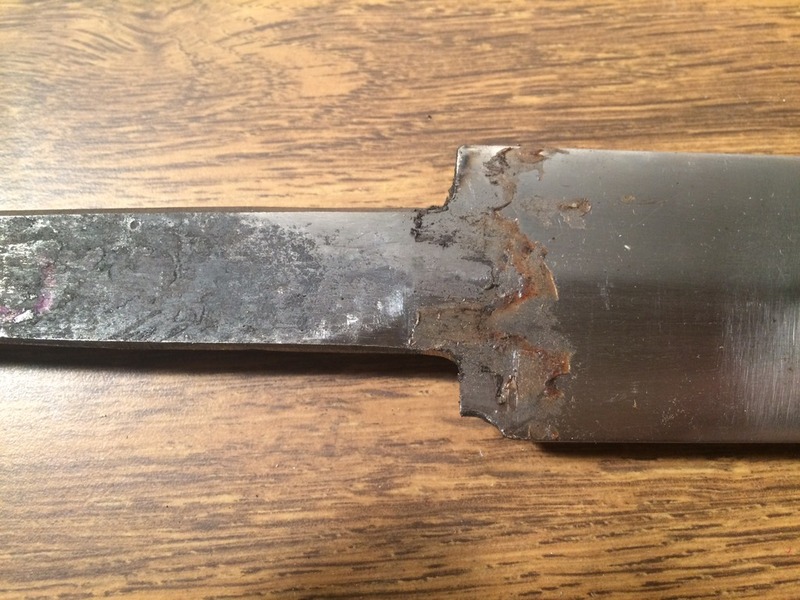 It it's not tempered, it may be possible to do your own heat treat. Thx for this mate, I love this sort of threads - very interesting indeed. The fact that they translated the rainguard leather flap to steel really cracks me up. I wonder how their designers are approaching historical design to end up with such a result...as picts of the cluny sword are not scarce online. They have gone a long way though and I've been very impressed by more recent pieces as shown on the thread below. I'm much less impressed by what I see here...very sloppy indeed. Bad finish, but nice tang. Even the threaded part doesn't seem welded on. The blade shoulders are indeed sad. 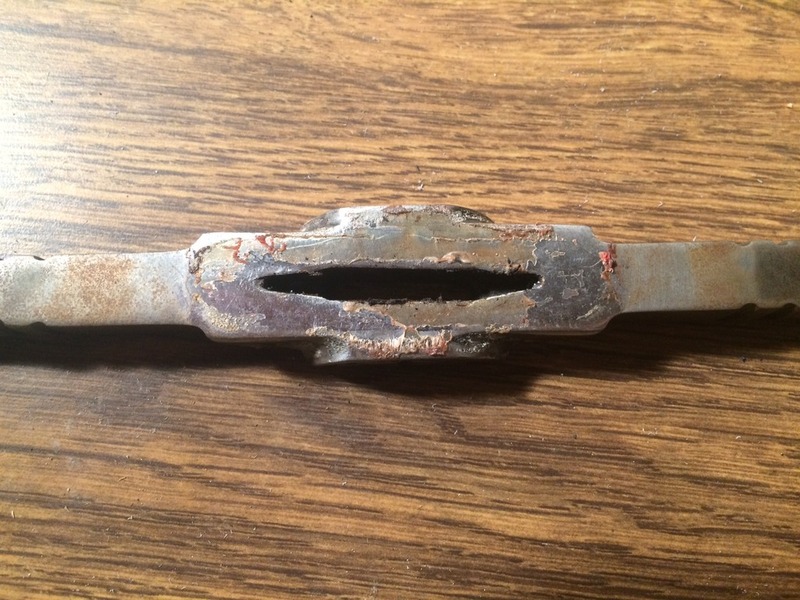 The centerline of the blade isn't aligned with the centerline of the hilt - looking back at he photo with the rain guard removed and prior to disassembly, this is clearly seen. This complicates a plan to re-use the blade without significant reshaping. Thanks for this thread Sam. These new Deepeeka models sometimes make me want to try Deepeeka again but then after seeing threads like yours, not anymore. This is good opportunity to see how sloppy they are on some parts. They are getting better but still long way to go before I will try them again.